It seems obvious to choose Shanghai or Beijing for a first visit to China. I would have done that too, but the minute I heard the words “panda city”, I was headed to Chengdu. I wasn’t even sure exactly where Chengdu was at first, but who cares, when the city is the official panda center of China! This is the place of dreamy bamboo forests, natural panda habitats, and the mother lode of all cute baby panda videos on the internet! 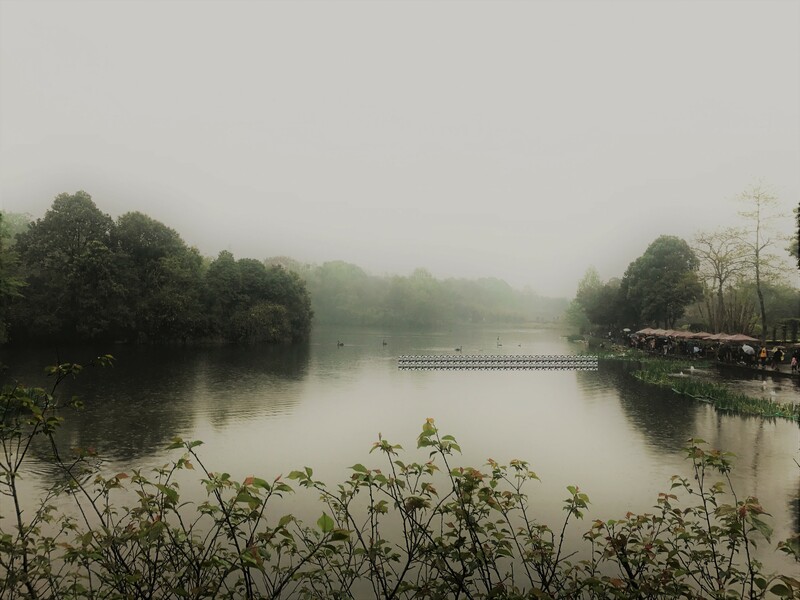 The more I found out about Chengdu, the more enticing it became. Chengdu is located in western central China, and aside from panda capital of the world, is the capital of Sichuan province and its famed eponymous cuisine. Oh Sichuan cuisine!! Hot, spicy Chinese noodles; soft, comforting Mapo tofu; braised beef and pork dumplings swimming in glistening red broth! My favourite kind of food! It kept sounding better and better. And then I came across the Temple House Chengdu, part of Swire Hotels’ high-style, luxurious House Collective, known for the ultra-cool Upper House Hotel in Hong Kong and Opposite House Hotel in Beijing. Among them, Temple House is unique in that it merges Swire Hotels’ luxury design ethos with historic Chinese architecture. These were all great reasons to visit Chengdu. Cutesy cuteness starts at the airport arrival hall. Chengdu was nothing like the congested Chinese megalopolises I’d seen pictures of. We drove into the city from the airport on a multi-lane highway lined with luxury car showrooms. Leafy streets and contemporary apartment blocks were interspersed with glossy office towers. Everything was brand new, well ordered, spacious, and apparently mostly built within the past ten years. People strolled the streets enjoying the warm spring weather. It was a very pleasant city, in fact, almost bland. You could easily mistake this for clean-cut American city, only all the signs were in Chinese, except for the ones that said Jaguar, Porsche, Maserati, and Ferrari. This is an affluent city. The landmark Anshun Bridge actually contains a restaurant spanning the Jin River. Beneath the newness though, Chengdu is in fact an ancient hub dating back to the 4th century B.C., but you wouldn’t know it from driving through present day Chengdu. Very little of the historic buildings are visible, aside from a pretty old bridge or two. While walking around the central business district with our local friend Jing Jing, I kept asking where the old town was, because I wanted to see traditional Chinese architecture. I love historic architecture, and the way it embodies the character of a city. “This is the old town”, she kept telling me, as we walked through a vast plaza and intersections lined with skyscrapers, gleaming office towers, glitzy neon signs and millennial pedestrians flaunting the latest fashions, from European designer labels to the latest in athleisure wear. “The ancient buildings are gone, “she said. “That’s what happens in the new China”. In this kind of slash and burn urban development, it’s impressive to see the historic preservation efforts at Taikoo Li, the luxury shopping and lifestyle plaza where our hotel The Temple House was located. Developed by Sino-Ocean and Swire Properties, this vast plaza of open air spaces and elevated walkways incorporates the centuries-old Daci Temple and antique traditional houses within its modern shopping complex. A harmonious marriage of past and future worlds at Taikoo Li. In contrast to the surrounding skyscrapers, the mall buildings are kept low-rise at only two stories high, the same height as the historic buildings in order to maintain the integrity of the classic architecture. The result is a beautiful balance between contemporary urban development and historic heritage preservation. We arrived at Temple House’s century-old stone gate and were greeted with a warm welcome by stylish general manager Kurt Macher and his cheerful hotel team. Right away, we felt at home. The hotel is built around three historic houses which comprise the main entrance lobby, and Mi Xun Teahouse and Spa, while two contemporary towers house the residential apartments and hotel rooms respectively. The building is relatively huge for only 100 guest rooms, because unlike many city hotels Temple House is very generous with space. The smallest rooms start at 63 sqm. (which in many other city hotels is the largest room size), and go up to 117 sqm. for the largest suite. My corner Temple Deluxe Suite was bright and airy, with 180 degree views. These elegant mah jong tiles are actually beautifully crafted chocolates. The suite was well stocked with jars of candies and chocolate. Photo by Luke Yeung. I love the luxury details like this cashmere throw. I was delighted with my Deluxe Temple Suite, a huge corner suite consisting of a living room, pantry, spacious bedroom with ensuite bathroom, two TV screens and even an extra guest powder room. The suite stretched the entire width of the building, and its floor-to-ceiling windows on three sides gave a 180 degree bird’s eye view of the cityscape. The balcony ran along the entire length of the suite with a panoramic view of the sprawling Taikoo Li plaza and Daci temple below. The central garden is landscaped to mimic China’s tea terraces. Photo by Luke Yeung. The tea terraces are actually dramatic skylights for rooms below, like the swimming pool and meeting rooms. Photo by Luke Yeung. There’s an easy flow of energy between the hotel and the Taikoo Li community. While the entrance lobby and guest rooms are privately enclosed in a landscaped interior garden, the dining outlets – the Temple Café, Jing Bar, and Mixun Tea House restaurant and Mixun Spa run along the perimeter, allowing open access between the hotel restaurants and the mall pedestrians. Temple House Café (right) and Mi Xun Teahouse (left), are open to the public and are part of Taikoo Li plaza. Photo by Luke Yeung. “Hotels shouldn’t be closed off only for tourists,” says General Manager Kurt. “They should be open for both visitors and the local community too.” Temple House is active in community projects such as giving free haircuts from the Mi Xun Barber Salon for an old folks’ home, and donating blankets and goods to a dog shelter to celebrate Year of the Dog Chinese New Year. Is it time to return to the spaceship already? But we just got here! Photo by Luke Yeung. Window washers keep the bamboo patterned glass exterior immaculate. Photo by Luke Yeung. Temple House hosts various community engagement events, such as a Global Fitness Day yoga event in June that’s open to the public, and Temple House Sessions featuring talks by influencers in the arts, fashion, design, culture, plus eco-initiatives and LGBT events. Temple House also supports NGOs by giving them free meeting spaces for certain events, “because sometimes these organizations just need a platform to share their work or educate a wider audience”, says Kurt. Luke makes his way across a pattern of drying rain in the hotel courtyard. It’s no surprise that Temple House is the city’s top location for fashion and design events. Jing Bar is a hotspot for the cool crowd of Chengdu. During our weekend there the hotel was the site for private events by Gucci and Shiseido. A contemporary art exhibition celebrating the Year of the Dog was on display in the lobby art gallery. Ready to start our Chinese dinner al fresco at the Mi Xun Teahouse. Photo by Luke Yeung. We were looking forward to dinner at the Mi Xun Teahouse , where we planned to savour Chengdu’s famous dish, the hotpot. The city is full of hotpot restaurants, some of them famous. But we were saving our stomachs for Mi Xun Teahouse . Despite the “teahouse” moniker, this is a proper restaurant specializing in vegetarian and vegan Sichuan cuisine. Mi Xun’s vegetarian hot pot (center), with Dan Dan noodles, silky Mapo Tofu, and braised mushrooms (left). Photo by Luke Yeung. As expected, the hotpot was delicious, delicate, and fragrant, using the freshest local ingredients including things I’d never seen before such as local mushrooms and greens. The dishes were so filling and flavourful that we didn’t even notice that they contained no meat. The incredibly delicious local Ice Plant, which I could eat over and over again. Photo by Luke Yeung. One local vegetable we’d been recommended to try was the “ice plant”, native only to Sichuan, and so called due to miniscule white follicles that look like frost, but is actually part of the plant. Mi Xun’s Ice Plant with Sesame Sauce was an absolutely delicious fresh salad, both for the flavourful dressing and the plant’s incredible texture which was springy, succulent, bouncy and crisp all at the same time. The texture and fragrant green flavor were incredibly delightful. “Oh my god, this is so delicious”, I kept gushing, while wolfing down the salad. ‘I can’t stop eating it!”. I loved this unusual springy texture. The ice plant and luxuriously silky soft Braised Mapo Tofu in Wild Mushroom Sauce were so tasty that we had to return to eat it again before we left for the airport. Hello! Look at me.! I am so, so, cute! You love me! Photo by Luke Yeung. Of course the highlight of our trip was a visit to the Chengdu Research Base of Giant Panda Breeding. What do pandas do all day? Cute things of course. Photo by Tim Blackburn. The pandas are absolutely adorable, from every angle, no matter what they do. I could easily watch them for hours. Nothing can be cuter than a Giant Panda! Except a baby Giant Panda, of course. Panda babies like to climb trees and sleep among the branches. ( I am cute! You love me!) Photo by Luke Yeung. The Panda Base, as it’s known for short, is where I realized that the Chinese are very eloquent when it comes to naming things. Everything seems to be weighted down with elaborately descriptive and wordy titles, and comes in contrasting yin yang pairings, such as the Sub-Adult Giant Panda Enclosure Zone A and the Sub-Adult Giant Panda Enclosure Zone B; the Sunshine Nursery House for Giant Pandas and the Moonlight Nursery House for Giant Pandas. In China there is always two of everything, because the Chinese believe in proper balance to form a whole. When you see the world this way, it all makes perfect sense. But it’s such a mouthful saying, “Excuse me, can you tell me the way to the Sub –Adult Giant Panda Garden Enclosure Zone A”? The sub-adult pandas would have finished their bamboo breakfast, burped, mated, and be asleep by the time you finish saying that sentence. I wondered why they couldn’t make it easy for everyone and simply call it Panda Garden. But then, it would sound like a Chinese take away place in New York. So that won’t do! Long names do lend gravitas, one realizes. They look so human when the sleep on their backs. Only a thousand times cuter of course. The panda base covers a lovely wooded park of lush bamboo forest and this beautiful swan lake inhabited by families of black swans. I love the way Chengdu loves and celebrates its most famous citizens. Pandas are everywhere in Chengdu, starting from the panda welcome signs and faux panda exhibit at the airport arrival hall, to giant panda sightings all around the city. I loved it. Even though I’m a full grown adult I still love cute things. By the way, my mother, who is a grandmother, drinks her daily coffee from a pink Hello Kitty mug. Kung Fu Panda and Pandazilla liven up the city square. This is no typical Chinese city. After a full day walking around the vast Panda Base, the contemporary Chengdu Museum, the People’s Park, and wandering around Taikoo Li, we were pooped out. The perfect time for a spa session! Mi Xun Spa aglow at night. Photo by Luke Yeung. Mi Xun Spa is set in the same historic house complex as Mi Xun Teahouse , and both are open to hotel guests and the public. The spa includes a Barber Salon offering wet shaves for men and haircuts for both men and women, and you can sip on whisky and cognac during the luxury barber treatment. Time for my bamboo massage. Photo by Luke Yeung. I had the 60 minutes Bamboo Autograph Treatment, consisting of an aromatherapy oil massage using bamboo sticks to knead knotted shoulder muscles, and a Chi Ni Tseng abdominal massage to release tension and improve the digestion. Inside the antique courtyard, spa treatment rooms are modern and luxurious. 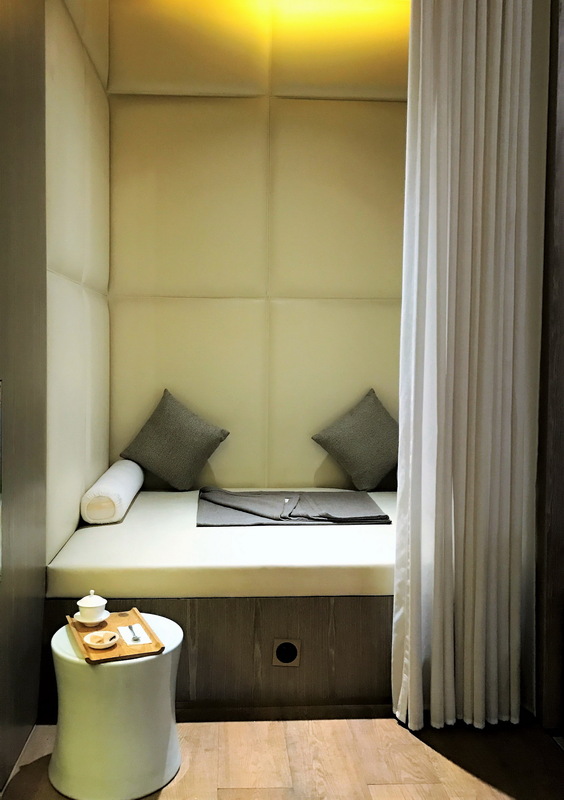 I especially liked the curtained private cubicles in the spa lounge, where post-treatment tea and delicate Chinese pastries are served. The lively night view of Taikoo Li from our 9th floor elevator lobby. Photo by Luke Yeung. On our last night at Temple House the hotel informed us that the lights would be off at 8.30 pm for Earth Hour, so we decided to go out for a springtime evening stroll around Taikoo Li. Even though we’d been wandering around it for the past three days, it was so huge that there was still plenty of ground to explore. We finished our walk late and found all the restaurants closed, including the hotel café. This was no problem. We could still order from the hotel’s 24-hour room service menu. Since we didn’t want to eat dinner alone in our rooms, the staff were happy to deliver our room service order to a table at the hopping Jing Bar if we ordered a drink from the bar. The bar’s throbbing Saturday night social scene was much more fun than dining alone upstairs. Negronis are the Temple House’s signature drinks at the Jing Bar. General Manager Kurt had told us that Swire Hotels’ style is all about personal service, and the hotel tries to be as flexible as possible to guests’ preferences, and here was a perfect example of this. We were happy guests that weekend. I’ve decided I love Chengdu and I’d only seen a fraction of it. There’s so much more to this city, this cuisine, and this region. Oh, and did you know Chengdu is also the gateway to Tibet? I definitely want to come back. We visited the Ancient Treasures of Afghanistan exhibit at the Chengdu Museum. Photo by Luke Yeung. Have you been to Chengdu? What was your favourite experience there? Great! I am going there next month so thanks for the useful thoughts! Glad you find this useful! I had a great time there and want to go back and explore more of the city and the food, and visit the second panda park which is located outside the city. Enjoy your visit there!